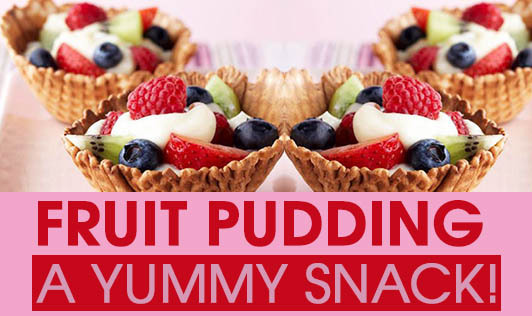 Fruit Pudding - A Yummy Snack! Pudding is a healthy mid morning and an evening snack for your child. It is packed with fruits, dry fruits, biscuits and fresh cream that can make it a high calorie and attractive snack for children. 1. Keep all the ingredients ready in separate cups as mentioned. 2. Mix sugar to fresh cream and dissolve it completely. 3. Take a big bowl and arrange about 2-3 biscuits in it. 4. On the biscuit throw some fruits, then dry fruits and 2 tbsps of fresh cream. 5. Again arrange the biscuit on the previous layer and follow the same procedure till all the ingredients are finished. 6. Close the large bowl and refrigerate it for 1.5 - 2 hours and its ready to serve. 7. It can be stored for 2-3 days by refrigerating it. 8. You can add any fruit that you wish to. I have tried this and it has been liked by many children. This can also be a wonderful recipe for a child's birthday party or when you have to cook up something for an eleventh hour guest!